Investigating and discovering the North Devon and Cornish coastline is a huge part of my job, which I love. The breathtaking views and awe inspiring ruggedness leaves me yearning to explore and acquire even more knowledge of this exquisite beauty that nature has so cleverly carved out for us. There are vast sections of the coastline which are remote and intimate and which many people have not frequented. One such place is Spekes Mill well known to enthusiastic surfers and cliff climbers alike and visited by celebrities and royalty for the intimacy and seclusion. such beauty is so close and so near. Nestling comfortably in the Speke’s Valley and surrounded by some of the most dramatic and savage coastal scenery lays Spekes Mill. Amazing rock formations are testament to the the awesome power of the sea and the prominent jagged outcrops stretch mysteriously out to sea like long,boney gnarled fingers. With its sandy beach and isolated rock pools this wonderfall indigenous creation gives me the inspiration and stimulus for my photography and paintings. surrounding environment is abundant with a diverse selection of flora and fauna. 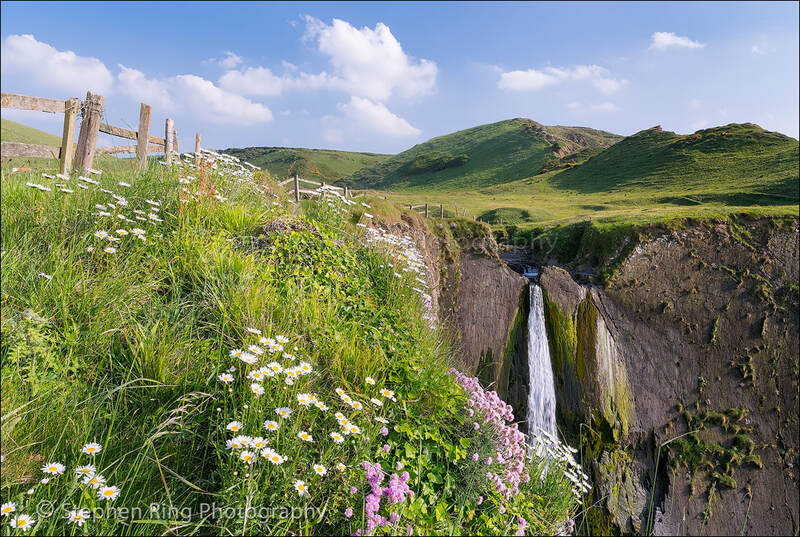 Wild and rare flowers and lichens carpet the valley in abundance and splash the cliff tops with an array of colour. This wonderment stands prominent in its glory and is right on our doorsteps. A true privilege, which is a rarity for many inner city folk .We are truly blessed to have this wonderful coastline so accessible and available to us and one that many of us take for granted. For more Images and High Quality Canvas, Prints of Spekes Milll.